"Itchycoo Park" is a psychedelic rock song written by Steve Marriott and Ronnie Lane, first recorded by their group, the Small Faces. The song reached number three in the UK Singles Chart in 1967. 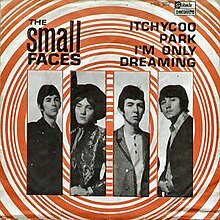 Long running British music magazine NME cites readers poll voting "Itchycoo Park" number 62 out of the top 100 singles of all time. "Itchycoo Park" climbed the charts again when it was re-released on 13 December 1975. The song was first conceived and largely written by Ronnie Lane, who had been reading a leaflet on the virtues of Oxford which mentioned its dreaming spires. A number of sources claim the song's name is derived from the nickname of Little Ilford Park, on Church Road in the London suburb of Manor Park, where Small Faces' singer and song-writer Steve Marriott grew up. The "itchycoo" nickname is, in turn, attributed to the stinging nettles which grew there. Other sources cite nearby Wanstead Flats (Manor Park end) as the inspiration for the song. We scammed the story together, we told the BBC that Itchycoo Park was a piece of waste ground in the East End that the band had played on as kids – we put the story out at ten and by lunchtime we were told the ban was off. Ronnie Lane said of the true location of Itchycoo Park: "It's a place we used to go to in Ilford years ago. Some bloke we know suggested it to us because it's full of nettles and you keep scratching actually". Itchy Park is located in the East End of London and dates back to the Victorian era. The term "Itchycoo", also appears in the Scots language from around the 1950s. Steve Marriott once said of The Small Faces "(We) were a mix of R&B and music hall. The R&B came from Detroit, the music hall from Stepney. That's what 'Itchycoo Park' is about…having a drink and a party." British band M People did a dance version of "Itchycoo Park" in 1995. The track peaked on number 11 at the UK Singles Chart and was remixed by David Morales. The music video for "Itchycoo Park" was directed by Maria Mochnacz. 1993: Heavy metal band Quiet Riot covered on the album Terrified. 1999: Itchycoo Park 1999 was a "Pre-Bonnaroo" like music festival in Manchester, Tennessee, the same place in which Bonnaroo is today. The festival was successful its first year but did not fulfill its plans to return in 2000. 1999: The song can be heard in the marijuana documentary Grass. 2006: The original version is heard in the opening scenes of the British film Severance starring Danny Dyer. 2009: Used in soundtrack for the movie The Men Who Stare at Goats starring George Clooney, Ewan McGregor and Jeff Bridges. New Zealand/Australian band Dragon covered the song on their album, It's All Too Beautiful (2011). 2015: Covered by Nellie McKay on her album My Weekly Reader. 2015: Covered by Alice Cooper's Hollywood Vampires on their debut album. 2018: The song can be heard in the Season 2 finale of The Handmaid's Tale. Commander Lawrence plays the song at his home. ^ "Guide to British Music of the 1960s". Making Time. Retrieved 10 August 2007. ^ Hewitt & Rod Stewart, Paulo; Hellier, John. Steve Marriott - All Too Beautiful... Helter Skelter. p. 160. ISBN 1-900924-44-7. ^ "RPM Top 100 Singles - January 27, 1968" (PDF). Library and Archives Canada. Retrieved 17 November 2017. ^ "NME Readers all time top 100 singles published 1976". NME. Retrieved 10 August 2007. ^ "Top 40 Hits of Mid January 1976". everyHit.com. Retrieved 10 August 2007. ^ Hodgson, Jay (19 August 2010). Understanding Records: A Field Guide To Recording Practice. Bloomsbury Publishing USA. p. 142. ISBN 9781441124098. Retrieved 13 February 2017. ^ Stojkovski, Dragan (6 September 2016). "Itchycoo Park". Kurrent Music. Retrieved 14 February 2017. ^ Oxford's Bridge of Sighs is mentioned in the first line. Hewitt, Paulo; Kenney Jones (1995). small faces the young mods' forgotten story. Acid Jazz. p. 99. ISBN 0-9523935-0-6. ^ "Small Faces London- Ilford Park". Making Time. Retrieved 10 August 2007. ^ Hewitt, Paulo; Kenney Jones (1995). Small Faces: The Young Mods' Forgotten Story. Acid Jazz. p. 98. ISBN 0-9523935-0-6. ^ Robinson, Tony (2016). No Cunning Plan. Sidgwick & Jackson. p. 30. ISBN 978-1-5098-4303-9. ^ "ITCHY-COO". Scottish National Dictionary/Dictionary of the Scots Language. Retrieved 26 July 2016. ^ "Itchycoo Park (1995) by M People". IMVDb.com. Retrieved 18 October 2018. ^ "Íslenski Listinn Topp 40 (NR. 149 Vikuna 23.12. '95 - 5.1. '96)" (PDF) (in Icelandic). Dagblaðið Vísir. Retrieved 19 July 2018. ^ "The Irish Charts – Search Results – Itchycoo Park". Irish Singles Chart. ^ "Official Scottish Singles Sales Chart Top 100". Official Charts Company. Retrieved 15 June 2018. ^ "Itchycoo Park, soundtrack to Severance film". 2006. Retrieved 22 September 2007. Paolo Hewitt John Hellier (2004). Steve Marriott - All Too Beautiful.... Helter Skelter Publishing ISBN 1-900924-44-7. "Whatcha Gonna Do About It"
"How Can I Love You More?"